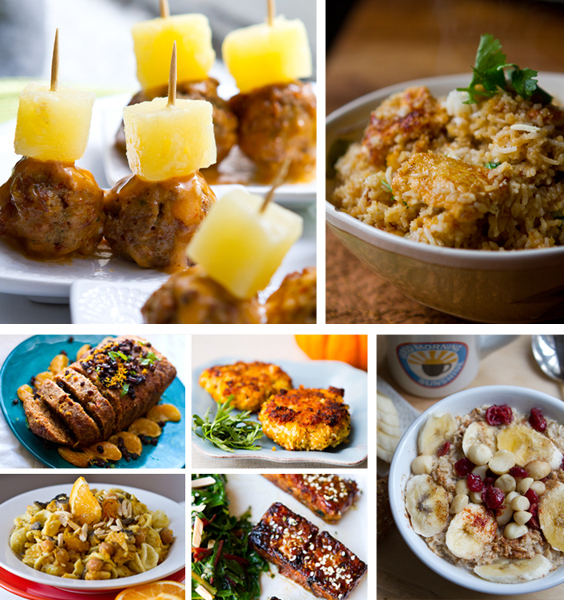 Thanksgiving Week: Meatless Monday Round-Up! Happy Thanksgiving week! It's the busiest time of year for at-home cooks, self-proclaimed foodies and food bloggers like me. Recipes, shopping lists, party preparations, bevies, table settings and plenty of pumpkin pies can keep our minds quite busy this week. So whether you are crafting an all-vegan feast or simply want to add some veg-friendly dishes to your spread - my recipes will give you a helping hand - and hopefully calm your mind just a tad. Vegan Thanksgiving Round-Up! So many recipes, so little time. Lets start with some Thanksgiving basics. This slideshow over at Babble has it all! Stuffing, cranberry sauce, veggie sides, entree ideas, desserts and more. Check out my 15 Vegan Thanksgiving recipes <-- START HERE. My classic faves and a few creative twists on tradition. * Sweet and Sassy Sweet Potato Pockets - an old have of mine! Cranberries, warm oats, macadamia nuts, spice and bananas make this a lovely breakfast for the holiday season. * Healthy Foods: Thanksgiving Foods to Indulge in! Thanksgiving is actually one of the healthiest meals all year if you pile the right types of food on your plate. From sweet potatoes to cinnamon - find out why these super foods are so super good for you! Have a guilt free feast. I adore a good Tofurky - but if you are a bit Tofurkied-out this year, here are 11 alternative entrees rich in vegan protein. Have a veg-friendly feast! There is nothing worse than a room full of hungry guests and a dwindling appetizer platter. Sure veggies and dip will work, but try these steamy hot cocktail balls glazed in a spicy sweet sauce. Zesty pineapple on top. Fried rice and sticky sweet, savory crisp Gardein chick'n bits. This warm bowl has nothing to do with Thanksgiving week .. but maybe that's a good thing! Fried rice gone vegan.. These adorable kitchen safety videos help you brush up on a few tips and get a good muppets-giggle in at the same time. * Snow Day? 14 Snow Day Recipes! * 11/14 - Pumpkin Porridge, Tofu Triangles, Senate Bean Soup, Glazed Sweet Potato Rounds.